Hula Hula Nights is an online video slot of 5 reels and 10 paylines powered by WMS software platform. This slot has everything that a player might needs while gambling. You can play Hula Hula Nights slot by using coin sizes of 10p to £500 per spin. The slot offers a jackpot of 500 times of your total bet and there are 3 bonus rounds available in this game which would offer free spins from 10 to 50 and up to 10x multipliers. Hula Hula Nights slot can be played at any desktop, mobile or smart phones. If you are looking to play this slot then you could choose any of the listed WMs online casinos here at top10casinoreviews.com. This slot is based on Hawaiian theme where you will find Green reels and the same symbols throughout the game. The game includes free spin feature as well as Big Bet Stakes feature where you will get 5 linked spins with double height scatters and the wild symbol will replace the scatter symbols yielding more cash prizes for you. Hula Hula Nights slot is a very simple video slot game which takes place on a purple background. The symbols of this slot games are like A, K, Q, J and 10 playing cards. 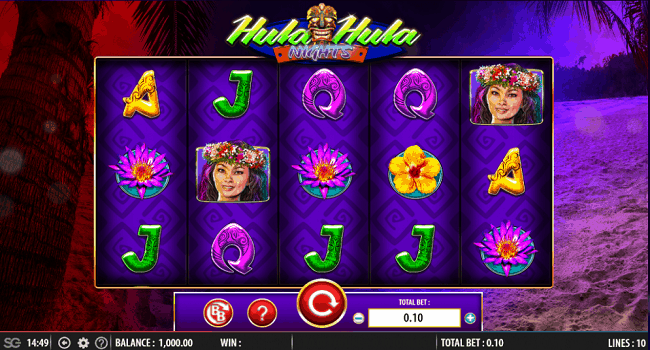 There are 3 different kinds of flowers, 2 Hula girls and a beautiful Hawaiian design in this slot machine. One of the Hula girl is the most lucrative symbol in this game and it could offer you 25 times of your total stake if you landing 5 of this symbol across a payline. The Hula Hula Nights symbol in this slot acts as the wild symbol and it can replace all other symbols except the collect symbol, Green reels and scatter symbols. Play this game for fun or for real money at any WMS casino online. The free spin feature gets activated when you land 3 or more of the scatter symbols on reels 3,4 or 5. 3 scatters will offer you 10 free spins, 4 scatters will offer you 15 free spins and 5 scatters on reels will offer you 25 free spins.